Christmas shopping doesn’t have to be a budget-buster. There are plenty of ways you can cut back on holiday expenses, shaving off a few dollars or even eliminating them entirely. If you’re looking for ways to cut back this holiday season, here are some of our favorite methods. This helps organize and budget for each person you’re buying for. Write down the gifts you’re wanting to get them and provide a max budget. When you’re out shopping this will deter you from getting unnecessary/extra gifts. We know how tempting that can be! This is the #1 reason why people go over budget on Christmas. You see things you’d like to buy for yourself and end up spending more than planned. Stay strong and don’t buy that big screen TV! The best deals are at discounted stores. Most items are from bigger brand names stores but these big stores consolidate and send older items to discount stores for a lower price! Starting the New Year with credit debt is not the way to go. Make sure you set aside cash for your budget when shopping. Racking up credit cards will take you back a step. Black Friday, Cyber Monday and Free Shipping Day are all important days to take advantage of so you can save those extra dollars. Prices are slashed by 20, 30, 40 , 50%! The more personal the gift, the more delighted the receiver will be. 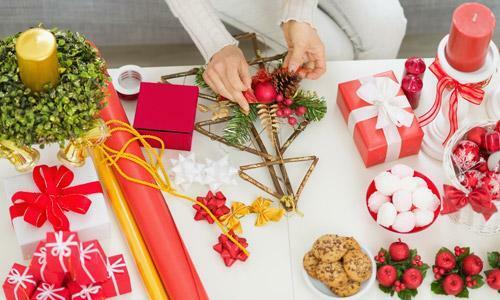 Even if you have enough money to buy all the gifts you have to and want to, make a few special ones by yourself so it makes it that much more special.